Pancreatic ribonuclease A (RNase A) is an efficient enzyme for the hydrolysis of phosphate-ester linkages in single-stranded RNA. There is strong evidence that the catalytic process occurs via a two-step general acid-base mechanism. The first step involves intramolecular transphosphorylation leading to a trigonal bipyramidal cyclic phosphorane intermediate and displacement of the O5'-nucleotide product. In the subsequent step, the cyclic phosphorane is hydrolyzed to a 3'-monophosphate nucleotide as the final product. Three amino acid residues within the active site, Lys41, His12 and His119, are known to play significant roles in the catalytic process (Figure 1). They are believed to act as a general base and general acid. Because of the availability of high resolution X-ray and neutron scattering structural data , RNase A attracts considerable attention as a target for theoretical studies . The purpose of this research program was to investigate the reaction mechanism of this enzyme using high level quantum chemistry methods of NWChem  with the highest feasible accuracy (DFT/B3LYP, Ahlrichs-pVDZ basis set) to provide an accurate representation of the chemistry of the active site (QM region) and molecular mechanics (Amber 99) to describe the remaining protein and solvent (MM region). For this enzyme reaction there is no data providing a detailed picture of any structures along the reaction path . However, there are structural data for a vanadate complex , which has been accepted as a transition state analogue. 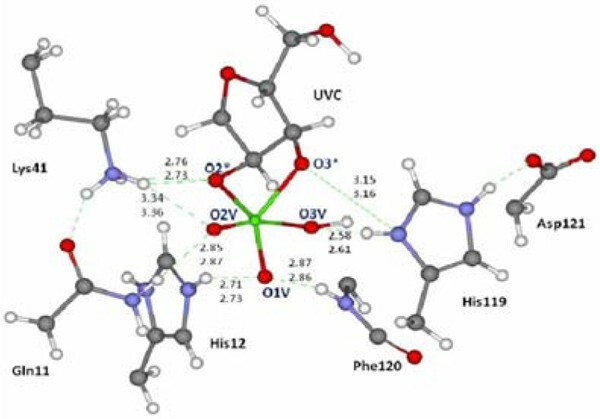 After evaluation of our computational analysis we substituted the central vanadium by phosphorus to model the intermediate state. Afterwards we elongated the endocyclic and exocyclic P-O bonds to find reactant and product states allowing for relaxation at each step. In addition a thermally averaged NEB method has been implemented to produce an unbiased view of the movement of atoms as the system evolves along the reaction path. Free energy calculations have been performed to account for thermal fluctuations of the protein environment. This way we could calculate the energy profile of the hydrolysis step and identify the transition state structures along the reaction coordinate.